The veterans have found a home for WWII. A talented roster of veteran free agents have found an organization to represent at the start of the Call of Duty: WWII season later this year. Patrick “ACHES” Price, Bryan “Apathy” Zhelyazkov, and Ian “Enable” Wyatt will join Anthony “NAMELESS” Wheeler on Evil Geniuses for the upcoming season, the organization announced earlier today. ACHES revealed his intentions to play with this group of players on Aug. 29—but now they have officially found an organization to call home. 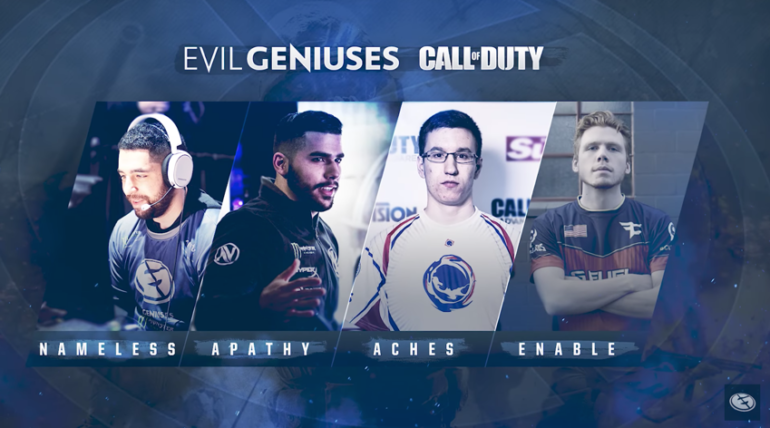 ACHES is no stranger to Evil Geniuses—he played under the organization for roughly six months in Call of Duty: Ghosts, and won MLG Anaheim 2014 and ESWC 2014. Enable most recently played for FaZe Clan since January 2015, and was officially transferred to EG earlier today. Apathy, on the other hand, left Team EnVyUs on Aug. 26. NAMELESS, who spent the entire Infinite Warfare season with Evil Geniuses, can’t wait to start playing with his new squad. Ryan Towey, a former Halo coach, will be “joining the team in a close managerial role, living and working with the members of our roster moving into our XFINITY Training Facility,” according to Evil Geniuses’ announcement. This roster has a lot of potential, and Call of Duty fans will be waiting with bated breath to see EG’s new squad competing in the WWII season, which is set to begin later this year.